Features thermo control top knobs and phenolic/stainless steel combination handles. 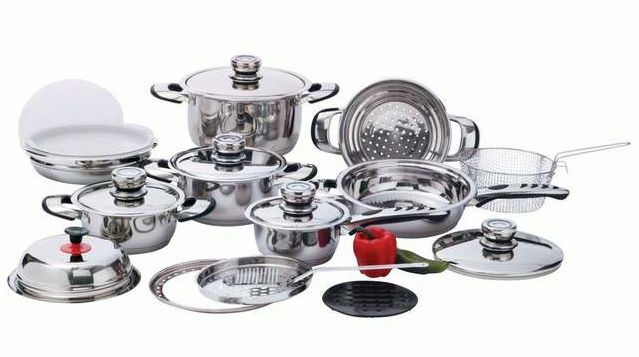 Includes 1.7qt saucepan with cover; 2.4qt casserole with cover; 3.3qt casserole with cover; 6.4qt casserole with cover; 9-1/2" fry pan with cover; 9-1/2" universal steamer; 7-7/8" and 9-1/2" mixing bowls with covers; grater with ring adapter and removable handle; frying basket with handle; trivet; and suction knob. Limited lifetime warranty. White box.